Environmental Audit » Join the Plant-in Day! Patrick Jones, Meg Ulman and Zephyr Ulman-Jones work together under the moniker of “The Artist As Family”. 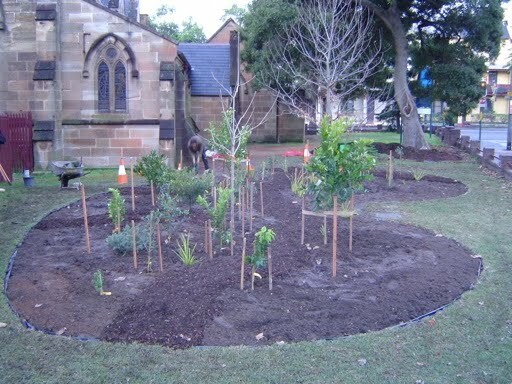 For their contribution to the In the Balance exhibition, they’ve been making an urban “food forest” in the grounds of St Michael’s church in Surry Hills. Check out their blog to see the work in progress, it looks rather lovely! Bring something edible, Cadigal or beneficial (herbs, perennial vegetables, ground-cover foods) to plant on the Food Forest floor between 10am – 4pm on Saturday 10 July. Make a day of it and bring a picnic to 200 Albion Street, Surry Hills, Sydney. During the day and into next week, I’ll be trying to assemble a rough list of the Food Forest’s energy expenses, as my first environmental audit case study. Patrick says he has all his receipts in a big pile, so it should be possible (to some extent) to trace the resource consumption involved in the production of the project. This entry was posted on Friday, July 9th, 2010 at 12:53 am and is filed under auditable events. You can follow any responses to this entry through the RSS 2.0 feed. You can leave a response, or trackback from your own site. I’m a supposed “expert in auditing unusual things”, so I’ve got some stuff I can give you to help out. Hit me up at the next class or at the Plant-in-Day and I can send you some stuff. Looking fwd to seeing you and L tomorrow.